This is the first of our reports from the legendary off-road 20 miler; The Grizzly. They started together on the esplanade in Seaton with the other 2,066 runners but had a very different day out on the Axe Valley trails, bogs, beaches and clifftops…. What an epic weekend. Started off with a really hard pool session on friday night. Apparently technique, not brawn is required. Needless to say I possess little of either, and judging by the number of people throwing life belts at me there is work to do! Saturday morning was supposed to be a gentle 5km tickover Parkrun in preparation for Sundays main event, but I DNF’ed after 2.5k in spectacular fashion. Yes, that is correct I did not finish a parkrun! Legs were like lead from the word go, and I felt exhausted. The icing on the cake was when I was passed by a pensioner walking a 3 legged dog, at which point my inner Miffy surfaced and I decided to call it a day. Sunday saw Sacha and I at the (in)famous ‘Grizzly’, a 20 mile coastal run on the East Devon coast from Seaton. This was a first for me, as I had previously thought it was all a bit tame for me. Oh my, was I wrong! It is a brutal, rough mind and body sapping ordeal that leaves everything quivering like jelly. The whole vibe is absolutely electric though and this should be on any serious trail runners’ calendar. Despite my previous days’ disaster, a good nights’ sleep seemed to do me the power of good and I beat my target of 3 hours and 20 minutes, to finish in 3 hours and 14 minutes. I had what I can only describe as an epic scrap with fellow Sandhurst Jogger Helen Antram, who has been on fire recently in preparation for the London Marathon I believe. She ripped passed me at the 14 mile point whilst I was having a bity of a grizzle, and for a while I did not have the will power or the strength to catch her. Eventually I managed to get firing on all cylinders and hauled up on her a mile later. Thereafter I ran in mortal fear of Helen catching me. She got to within a few feet of me on several occasions, but I valliantly managed to squeak over the finish line just ahead – all is fair in love and war! 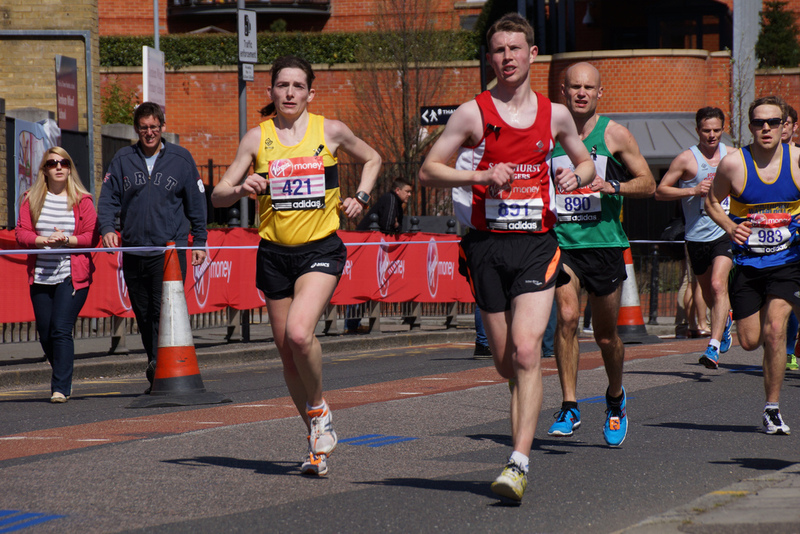 (althought she has probably beaten me on chip timing, as I had the audacity to push towards the front for the start). Sacha was having a good race until she tripped at mile ten and after a downhill tumble, managed to arrest her descent with her head. She gamely picked herself up and battled through the last 10 miles with blood streaming down her temple and a huge black eye. Once the adrenaline ceased flowing the poor lamb started feeling a bit rough and it was rather an anxious drive home, and for once I was very happy to listen to 2 hours of ‘girl witterings’. Fortunately after 90 mins in A & E, all is well that ends well, although she will be sore for a day or two.